In a time when “going green” has become a trend, a number of Elon University students have said they are environmentally aware and that their Elon education has impacted their environmental education. According to an informal survey of 158 students, 145 said that they are environmentally aware, stating that they understand the importance of protecting the environment. The survey, conducted on Earth Day 2011, explored environmental awareness on campus, as well as the steps students take in order to reduce their impact on the environment. Many students have found that Elon has impacted their understanding of being environmentally aware, with 81 percent of students stating that their education has influenced their awareness. “There are posters everywhere, so they definitely think it’s important,” said Elon sophomore Kenny Dunkle. In the week leading up to Earth Day 2011, several university organizations and departments have sponsored events and initiatives to raise awareness, including the Sierra Club, the Sustainability Living and Learning Community and Students for Peace and Justice. However, throughout the school year, students are challenged to take action through events such as Recycle Mania and Powerless, competitions between living areas to see who can recycle the most or use the least amount of electrical power. 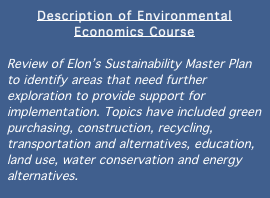 Similarly, there are classes at Elon devoted to a greater understanding of sustainability and planet preservation, including environmental communications and economics courses. Despite the level of environmental awareness on campus, about 31 percent of the students surveyed said they are not concerned about global warming and don’t always take action to make an impact. According to Dunkle, he’ll recycle only if it’s convenient. “I don’t go out of my way,” he said. However, others surveyed said that it’s incredibly important for individuals to do what they can, several of them encouraging students to participate and become involved. Other students said that turning off the water when brushing their teeth, taking shorter showers and unplugging electronic devices when not in use were part of what they did to make a difference. Students can also becoming involved in student-run organizations with an environmental focus, including the Sierra Club and the Elon Volunteers Green Team. Your headline has useful details and you pulled in some interesting additional information bits from the community that add value. You followed the assignment well in that regard! The words “believe,” “feel” and “think” are NOT interchangeable with “said.” The word “said” connotes no judgment on your part. You do NOT know what people believe, think or feel; you only know what they say. Do not use feel, believe or think instead of said.